A scholar very much rooted in the tradition of British cultural studies, Angela McRobbie first turned her attention to the figure of “the girl” in an important set of analyses of magazines aimed at working class British girls. Her work on the 1970s periodical Jackie explored the ideologies of working class femininity embedded in popular culture aimed at girl readers and identified the centrality of romantic individualism: a sort of every-girl-for-herself in the pursuit of a boyfriend. In the 1980s, she began to examine surprising and welcome shifts in girls’ magazines, shifts largely owing to the integration of feminist rhetoric—if not feminist politics—into juvenile popular culture. If Jackie promoted a romantic individualism structured around the pursuit of an appropriate male partner, by the 1980s, magazines like Just Seventeen promoted a different kind of femininity. By downplaying boyfriends and husbands-to-be, and instead emphasizing self-care, experimentation, and self-confidence, girls’ magazines seemed evidence of the integration of feminist common sense into the wider cultural field. By the 1990s, McRobbie argued that the magazine industry might be viewed as a key site of knowledge transfer, especially as the industry appealed to and recruited from feminist-influenced graduates. In her most recent book, The Aftermath of Feminism, McRobbie reflects on what she now sees as her overly optimistic declaration of feminism’s success. “I attributed too much hope,” she writes, “in the capacity of the world of women’s magazines to take up and maintain a commitment to feminist issues” (4-5). She describes her work and the work of other feminist cultural and media scholars as over-enthusiastic and as potentially complicit with forms of popular feminism that she now identifies as central to the undoing of feminism as a political project. Although the book often reads as a mea culpa, it is also a valuable reflection on the impact of theoretical trends that shaped both cultural studies and feminist cultural studies in the 1980s and 90s. Buoyed by cultural theory that searched for and celebrated acts of subversion and transgression, feminist scholars were keen to find feminism in everyday culture, including popular culture. In the process, notes McRobbie, the commitment of a leftist feminist politics to dismantle large-scale oppressive or regulative structures has too often fallen to the wayside. Although the book takes the girl as a key object, and is surely an important addition to the vibrant field of girl studies, the subject of the book is ultimately those “new modes of regulative gender power” (115) that cohere around the figure of the girl. Influenced by Pierre Bourdieu’s analysis of the social field, McRobbie asks important questions about the social field(s) into which young women are habituated. These are fields, she argues, in which the liberation of (white, middle class, mainly heterosexual, Western or Western-bound) women is taken for granted. These are fields shaped by a new sexual contract that encourages girls and young women to take advantage of the opportunity to study, to gain qualifications, and to work; a sexual contract that encourages them to control their fertility, to explore their sexuality, and to participate avidly in consumer culture. In this context, the girl is no longer adequately conceived as a disciplinary subject in the Foucauldian sense but instead emerges as a site of luminous potential. Using this language of luminosity, borrowed from Gilles Deleuze, McRobbie argues that girls are interpellated into subject positions that endow them with limitless capacities, but these capacities are distanced from the new global economy that produces and carefully regulates the girl. Central to Aftermath is the insistence that contemporary celebrations of girlhood as a site of luminous potential ought not be celebrated as signs of feminist success. Though it seems to secure and even promote gender freedom, the new sexual contract offered to girls ultimately secures a carefully delineated “feminine citizenship” (54) that benefits right-leaning consumer culture, feeds a capitalist labour market, and ultimately contributes to what postcolonial feminist scholar Chandra Mohanty calls the re-colonization of culture and identities. McRobbie reads the emergence of a new sexual contract, its multiple technologies of girlhood, its normalized pathologies of femininity, and the related widespread gender- and class-based symbolic violence in popular culture as symptoms of a post-feminist culture. A hotly contested term of reference in the field of women’s, gender, and feminist studies, post-feminism is understood by some to be simply a term of periodization (denoting the period following the demise of second-wave feminism); others use it to indicate an emergence of new forms of feminism (third-wave feminism). McRobbie, however, sides with those for whom post-feminism is equated with anti-feminism. On this view, the “feminism” that informs post-feminist popular culture and cultural theory is a “faux feminism” (1). For McRobbie, feminism must always be tied to larger radical democratic political movements. Shaped by neoliberalism, post-feminism’s “feminism” is organized around notions of choice, empowerment, and personal gain that are deeply individualizing. Post-feminism, then, is founded upon a double movement that pushes away, rejects, and disavows feminism as a collective political movement in the same instant that it appears to support its demands. In what I take to be Aftermath’s most rewarding chapter, “Top Girls? Young Women and the New Sexual Contract,” McRobbie describes the ways in which neoliberal economic policies have supported (and indeed depend upon) women’s labour participation, increased education, reproductive freedom, and global mobility. The modes of independence that result from these liberties stand as significant challenges to traditional gender relations. In response, however, McRobbie argues that the Symbolic, understood here in the Lacanian sense as both the source of sexual identifications and patriarchal authority, moves quickly to reassert its power. The Symbolic “allows itself to be dispersed” and “discharges (or maybe franchises) its duties to the commercial domain” (61). In the moment that women seem to have attained many of the freedoms most aggressively demanded by second-wave feminism, a vigorous commercial culture steps in to re-secure the terms of traditional gender relations. The new sexual contract produces new subjectivities, each produced in a particular zone or “space of attention” (58). A post-feminist masquerade is produced by the fashion-beauty complex; the working girl is produced by the spaces of education and labour, the spaces of sexuality and reproduction produce a phallic girl, and a global political culture that turns on increasing mobility produces the global girl. Although the chapter would benefit from a more thorough working through of some of the subject positions described here, McRobbie nonetheless offers compelling arguments about the ways in which young women are drawn into the double movement that characterizes post-feminism. I was particularly struck by her descriptions of a post-feminist masquerade, understood as “a new form of gender power which re-orchestrates the heterosexual matrix in order to secure, once again, the existence of patriarchal law and masculine hegemony” (64). Nostalgic, retro, and apparently light-hearted performances of glamour by post-feminist fashionistas are read here through Judith Butler and psychoanalyst Joan Riviere to suggest that this theatricalized femininity, though posed as a matter of personal choice and playfulness, also plays into the demands of a fashion-beauty complex. Practices that might be read as transgressive and subversive can also work to lock young women into what McRobbie calls “new-old dependencies and anxieties” (10). McRobbie argues that feminism as a political project has been removed from the political imaginary, disconnected from the contemporary, and disarticulated from the field of radical democratic politics, only to be replaced by a faux feminism characterized by misleading and often damaging declarations of girl power. Ultimately, the point of Aftermath is to draw attention to the ways in which the feminist complaint has been rendered irreconcilable with those social fields into which young women are habituated. Drawing on both popular and scholarly texts, McRobbie argues that feminism is the object of disavowal and caricature; when it is not ignored, it is depicted as having relevance only to a faraway place or a faraway time. Gender mainstreaming in political institutions and public agencies places the need for feminist activism in the past. The increasing deployment of postfeminism within feminist scholarship contributes to the dismantling of a political and intellectual tradition that has at its core a commitment to unveiling established power and gender hierarchies. 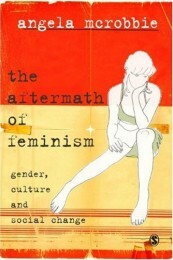 The Aftermath of Feminism thus reminds readers that the urge to celebrate feminism’s apparent political successes is premature, in popular and scholarly settings alike. Michelle Meagher is Assistant Professor of Women’s Studies at the University of Alberta, where she teaches courses on the topics of feminist history, popular culture, and representations of gender. Her research is concerned with feminist and feminine self-representation in contemporary art practices. Her work on this topic has been published in Hypatia, Body and Society, and Woman’s Art Journal.